If cleanliness is next to godliness, then fish must be downright saintly. Doesn’t living 24/7 in the ocean keep fish clean, you ask? Not exactly. While they don’t need to hit the showers like we do after two sets of tennis, they still need to have their dead skin and scales removed, as well as tiny parasites that live on their bodies and inside their mouths. Left unattended, the parasites will multiply and eventually kill the fish. Without the benefit of hands (or Waterpiks), getting rid of parasites can be a bit challenging, to say the least. But fish have worked out an effective system that’s mutually beneficial to themselves and their designated hygienists: cleaning stations! These distinct areas can be located right on a coral reef head, under it (especially with shrimps), between outcroppings, underneath clumps of floating seaweed or right out in public, in the water column. The “client” fish receives a first-rate spit-and-polish job, while the cleaner gets a free meal. It’s a beautiful thing — and it’s a classic example of symbiosis, or mutualism, an ecological interaction that benefits both the party of the first part and the party of the second part. Tiger Grouper at a cleaning station. You may wonder how the groomers find their clients without the benefit of social networking. Actually, there are a few different ways, and they involve some complex behaviors that we usually associate with humans and primates (kind of like the fish equivalent of a secret handshake). Sometimes the cleaner advertises his services, typically by sporting a “uniform” that serves as a signal to potential customers (which is doubly clever, says a new study, as it also helps the fish avoid being eaten by their clients, which is never a good business model). 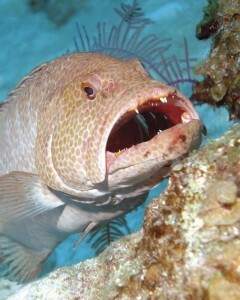 When a potential “host” approaches a cleaning station, he will open its mouth wide or position himself in a way that indicated he needs cleaning. 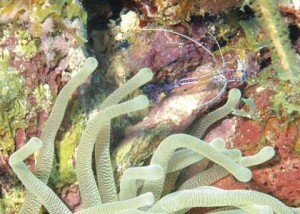 Sometimes hosts congregate and perform specific movements together to attract the attention of the cleaner fish. Apparently those moves save their lives, as somehow this further signals to the potential predator that these small fry are off the menu. Scientists have long wondered about this interaction, so an Australian researcher, Karen Cheney, and her colleagues recently decided to test the “uniform” theory, which holds that colors and body patterns are what set cleaners apart. And with some creative testing methods, including painting fake fish and attempting to lure clients, they discovered that the color theory holds water, so to speak, and that cleaner fish are more likely to sport a dark side stripe accentuated by patches of blue and yellow. 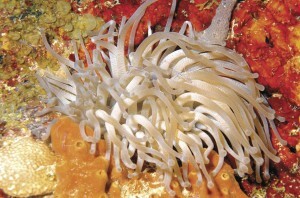 Giant anemones are a favorite home to several kinds of cleaners. Shrimp are a whole other matter. Take the Banded Coral Shrimp, for instance. None of this “flashing some tacky blue and yellow costume and waiting around in the open water for just anyone to come in and ask for a clean-up job” for him. This highly specialized cleaner of larger fishes sleeps by day, and then as the sun goes down, begins his patient wait until his discerning clientele come swimming by under the cover of night. 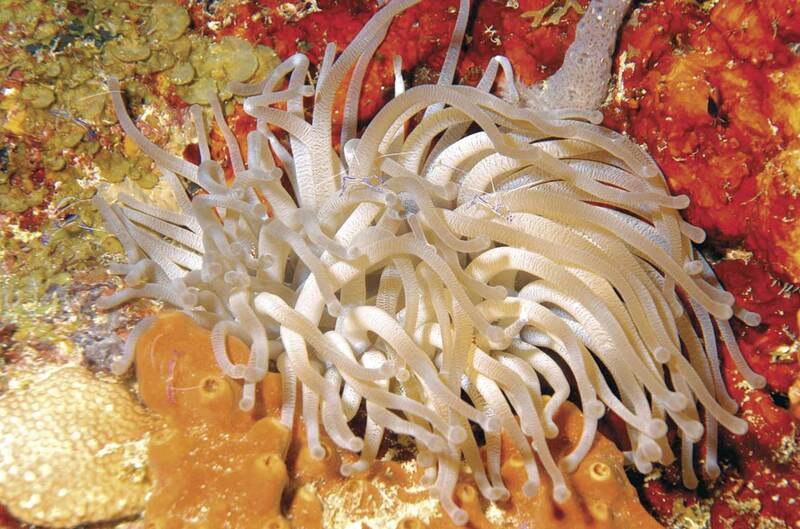 And his way of attracting business is stage-worthy: this crafty cleaner performs a discreet dance in which he shakes his white antennae and banded body — while hanging upside-down under a small coral head. Divers love to get in on the cleaning action. You’ve heard of a French manicure. Well, Barbara and I have both gotten what’s known in the biz as a Pederson Manicure. And you, too, can get a professional nail job while snorkeling or whiling away the last three minutes of your dive doing your shallow-water safety stop. Search out an anemone (Barbara looks for corkscrew anemones like the ones in these photos) then gently place your hand in front of it and wait. (You’ve got at least three minutes of bubble time before you come up, so why not?) In pretty short order, one or possibly several Pederson cleaner shrimp will show up, climb onto your fingers and get busy clearing out the dead skin around the fingernails — and whatever else may be on your fingers. Sometimes cleaner gobies will join in and clean up and down your entire hand. And while we have never done this, we’ve seen other, more adventurous (or dirtier) divers who’ve found a cleaning station remove the regulator from their mouth, open wide and invite cleaner shrimp to come in and clean their teeth! Once you know what you’re looking for, you’ll not only never miss a cleaning station again, but you’ll no doubt seek them out. And yet, as common as they are, trying to find and photograph the creatures for this article presented Barbara with a couple of serious challenges. First, she said, coming upon fish being cleaned without disturbing them is a lot tricky than you’d think. And then she confronted the added difficulty of finding those teeny, tiny cleaner shrimps as they hid in various anemones. We’re talking about creatures ranging in length from an inch or two down to less than a quarter-inch! Barbara claims she needs bifocals in her dive mask, but I think she did a pretty amazing job with these photos. And you should see her nails: divine!